We bring trauma informed programming to children in refugee camps and crisis situations. On the surface, our work may look like school, it may look like play. Dig deeper and you will find a set of guiding principles that informs every choice we make. Providing mobile, trauma informed education art and play to children displaced by conflict and crisis. The Schoolbox Project provides mobile, solar-powered child-friendly spaces that operate from whatever infrastructure is available. 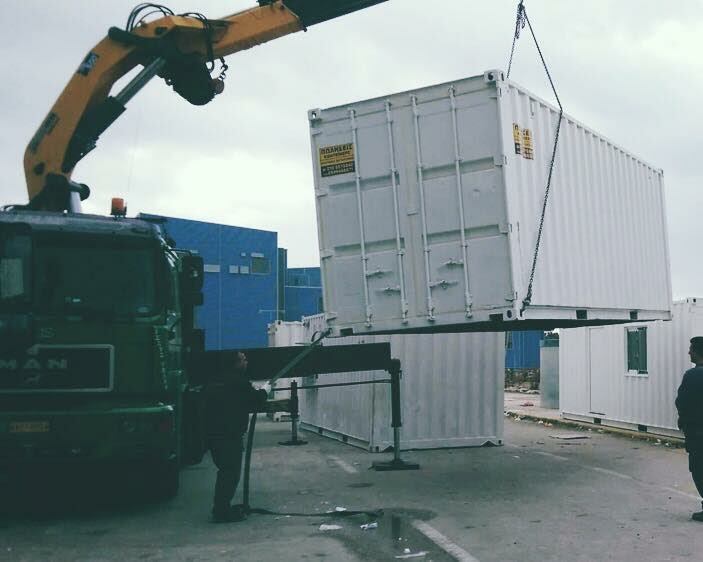 We convert shipping containers, schoolbusses, abandoned buildings, tents, bamboo structures- or even sidewalks into classrooms. Each of these "Schoolboxes" are simple and nimble, and designed to be operational within days of deployment or relocation. We staff every Schoolbox with a Director and Assistant Director, as well as with a rotation of vetted, trained teachers and volunteers. We train all volunteers on the unique needs of traumatized children. The Schoolbox Project guiding principles, policies and volunteer handbook of the project travel with each Schoolbox to deliver effective and consistent support. A Schoolhouse - We organize instruction by age and languages spoken. Teachers deliver math, language, and other lessons using proven, best-in-class educational techniques. Art and Play - We offer rotating art, music, sports and drama projects for children who have little opportunity for creativity and emotional expression during extended trauma. We emphasize quieting, reflective and nature-inspired activities to provide balance to the overwhelming diet of "sensory junk food" children must cope with in refugee camps. Solar Powered Charging and Wifi Zones - These are offered in camps where power is otherwise limited. Child Friendly Space - This is a humanitarian term used to describe an approach to supporting the safety and well being of children in the midst of emergencies. This term has been used widely since 1999. Child friendly spaces protect children by providing a safe space with supervised activities, raising awareness of the risks to children, and identifying and supporting vulnerable cases. Generally, child friendly spaces refer to a relatively short to medium term program response, and are very often operate from temporary structures. There are universal minimum standards for these spaces. No Time-Outs – All behavior is communication. We do not exclude and isolate children as a response to their communication of their need through challenging behavior. No Kick-Outs – Each day, a volunteer is designated the “One-to-One of the Day” to be available to children needing extra support in class. We never reject children because of challenging behavior. No Photos – We prioritize full presence in each moment and work hard to develop trusting relationships. For this reason and to protect children at risk for exploitation, we do not allow photos of the children. Rhythm and Routine - Every day we open and close our Schoolbox Project in the same way to provide gentle rhythm and simple routine. For children who have only known uncertainty and trauma, the rhythm and routines we provide build certainty and comfort. Family Services - We offer in-home support to families with children who need additional support in order to thrive. Volunteers deliver services wherever the family sleeps, regardless of location and including a squat, tent or other temporary shelter. “Schoolbox Toolbox” - The Schoolbox Toolbox is a curriculum developed to provide children with crucial self regulation skills and an understanding of how trauma and stress may show up in their bodies and life - in camp and beyond. Emphasis is placed on empowerment and post-traumatic growth. Parents are given support and tips on how to help their children feel safe in an unpredictable environment. The curriculum for training volunteers addresses topics such as self-regulation, understanding our brains and post traumatic growth. Volunteer Training and Support - We provide volunteers with online and in-person training before they arrive at their camp. Once in the field, volunteers can access 24-hour crisis support and a 24-hour advice nurse.